A revolutionary new product, the BAKBox! 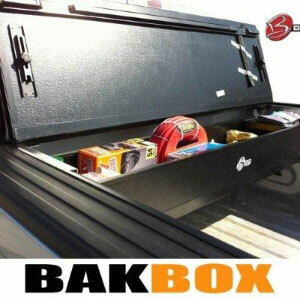 For those still unaware, the BAKBox will do for the toolbox what the BakFlip did for the tonneau cover. In a nutshell, it provides you with a toolbox that is easily folded up to takeup NO SPACE IN YOUR TRUCK when you don't want it. In essence, tt's there when you need it and gone when you don't. Best of all it integrates with any BakFlip Tonneau cover, so you can purchase with your new cover or if you own a BAKFlip, you can easily add this to your cover! See the full details and purchase the BAKBox .